Japanese director Yasujiro Ozu is perhaps best known for his 1953 film Tokyo Story, or maybe Late Spring from 1949. However, it�s An Autumn Afternoon, the last film he shot before dying of cancer in 1963, that just might be his masterpiece. His career spanned over 30 years, including the World War II time period, which, of course affected his Japanese homeland arguably more than any other nation in the world. The aftermath of the war directly influenced his films that followed its conclusion, and now, The Criterion Collection allows U.S. film buffs to enjoy his aforementioned swan song on a wonderful single-disc release. Shuhei Hirayama (Chishu Ryu) is a widower that lives in the same house with his only daughter, Michiko (Shima Iwashita) and youngest son, Kazuo (Shinichiro Mikami). His other son, Koichi (Keiji Sada) lives on his own with his wife, Akiko (Mariko Okada), and Hirayama is feeling that it is time for Michiko to marry someone, herself. His best friend, Kawai (Nobuo Nakamura) has someone in mind for Hirayama�s daughter, but he realizes that she never pursued marriage in the past to take care of him. This realization comes to the forefront while talking with The Gourd (Eijiro Tono), who is in a similar situation with his own daughter, but if Hirayama can convince Michiko to live her own life, he knows she will be better off and truly happy. Ozu has always delivered laid back, subtle movies, and An Autumn Afternoon is no exception. While it wasn�t planned as his final film, it ironically works as the perfect microcosm of many of the themes he�s touched upon throughout his career. It�s rather clear that Hirayama is Ozu, and vice versa, and in this case, as with most of his films, he is the ultimate patriarch, working with his core group of actors (his children), nurturing them and growing their talent from film to film. Ozu�s movies are all about family, and he�s obviously invested so much in not only his own, genetic family, but in these actors, that he clearly places everyone involved in the making of his movies as nearly as important than those connected to his family tree. Ozu�s actors are at the top of their game here, as well, with Chishu Ryu giving an unforgettable performance as Hirayama. Ryu allows us to read his character�s specific feelings right on his face, using simple expressions to deliver emotions that are much more powerful than any dialogue he speaks. Shima Iwashita is also quite good as Michiko, in a dynamic role, but the most interesting work comes from the actors that embody the group of men who gather to eat with Hirayama. The conversations that come from these gentlemen are simply mesmerizing, and, without them, there would be a gaping hole in Ozu�s final masterpiece. What we see near the end of the film is as symbolic as it gets, with Hirayama clearly reflecting upon his life and its meaning. While the backdrop of this sequence is his daughter�s wedding, this is Ozu meditating about his own life, and, probably, filmmaking career. With a career rife with symbolism in his rearview mirror at the time, it�s no surprise to see more of the same in his final film, but the irony behind his directorial choices in An Autumn Afternoon is impossible to ignore. Image Transfer Review: Presented in its original full frame format, the images are crisp and detailed for the most part, but there is quite a bit of dirt and grain that is at least somewhat distracting. The colors are rather muted as well, but there�s enough vibrancy on display as a result of the restoration done for this release. Audio Transfer Review: The original Japanese mono soundtrack is here, and is as good as can be expected given the age of the material. The key here is the clarity of the dialogue, and there are no issues in that department. Extras Review: The extras include an audio commentary track with author David Bordwell, who wrote Ozu and the Poetics of Cinema. Recorded for the Criterion Collection in 2005, this full-length commentary gives us a shot-by-shot overview of the numerous themes that Ozu covers during An Autumn Afternoon. There are also excerpts from �Yasujiro Ozu and The Taste of Sake.� This is just under 15 minutes from a French TV program that has critic Michel Ciment and writer Georges Perec going over the evolution of Ozu�s filmmaking style throughout the years. This episode was directed by Jean Baronnet and originally aired on November 26, 1978. We are also treated to two trailers for An Autumn Afternoon and a great 28-page booklet. 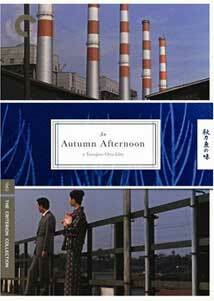 A compelling capper to a legendary film career, Yasujiro Ozu�s final movie, An Autumn Afternoon is a fitting swan song, and then some. The Criterion Collection delivers the film in a fitting release that restores it quite nicely, and includes some extras that give us a nice, in-depth look at the making of the film.